Really useful spray heads that fit to plastic drinks bottles. perfect for using with weed killers or other products that need a controllable spray mist. 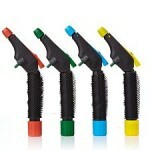 Set of four adjustable pressure sprayer heads. The set features sprayer heads in four different colours that attach to most plastic bottles to create a pressurised spray bottle for liquids such as detergent and weed killer. This is a unique and useful utensil for versatile use around the home and garden. Universal fitting – easily attaches to most household bottles (0.5L – 3L) so you save money and are more environmentally friendly too. Coloured tops for safety – the sprayer heads come in four vibrant colours to distinguish between the liquid you use in each one, for example: blue for water, red for weed killer, green for fertiliser and yellow for detergent. Anti moss spray at QVC – this amazing anti moss spray is back in stock. It sold out back in April. Get rid of ugly moss, algae and lichen with this non-toxic and bio-degradable anti-moss spray. Simply spray the affected area, leave it for 36 hours and it will begin to disappear. In 48 hours it should be totally clear, then you can just sweep it away. This 2.5L spray will cover an area of about 20 square metres. It can be used on block paving driveways, patios, decking, fences, canvas and brickwork. You can even use it on glass or plastic conservatory roofs as long it doesn’t rain as it takes a little longer on non-porous materials.